If you’re looking for a fun homemade gift idea for the holidays, then you’ll definitely want to consider these super cute DIY Handmade Gingerbread Men Snow Globe Soaps! Kids love bathing with these fun soaps. And once the soap is gone, they are left with a little gingerbread man figurine they can take along with them on all of their holiday adventures! Keep reading to learn how to make your own melt and pour snow globe soaps and for a chance to win an all inclusive DIY Snow Globe Soap Kit from Wholesale Supplies Plus! 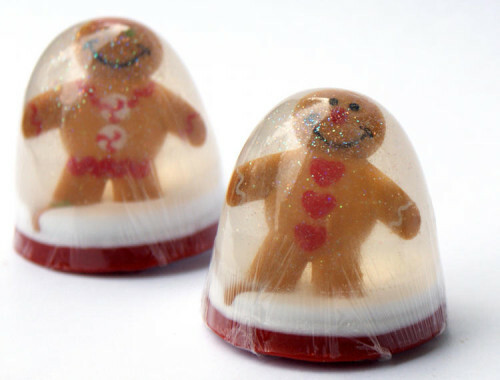 This recipe yields 10 gingerbread snow globe soaps, however if you purchase the snow globe kit you can actually make up to 12 by slightly increasing the recipe. (The gingerbread men are sold in packs of twelve.) You can make 8 snow globes with one cake pop silicone mold in two stages – as it only has 8 cavities – or you can make them all at once if you have two of these molds. Start by filling a small spray bottle with rubbing alcohol. You will be using this to spritz on after each layer of soap to prevent bubbles and help the layers adhere to one another. 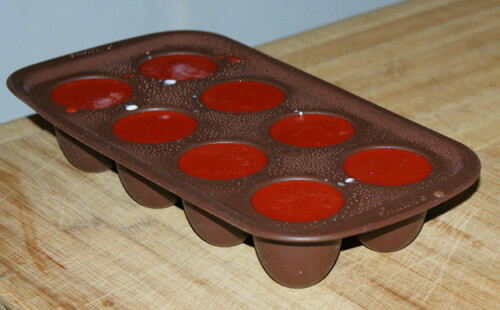 You’ll also want to place your silicone mold onto a cookie sheet or cutting board in case you need to move the soaps while they are still setting up inside the mold. Now begin making your soaps by first weighing out the clear melt & pour soap base. Cut it into chunks with a knife or soap cutter then melt in the microwave just until melted. This melt & pour soap base melts really fast – under a minute! – so watch it carefully. Once melted, measure out the Peppermint Stick Fragrance Oil with a plastic transfer pipette and stir into the soap base. Measure out the glitter and stir it in as well. 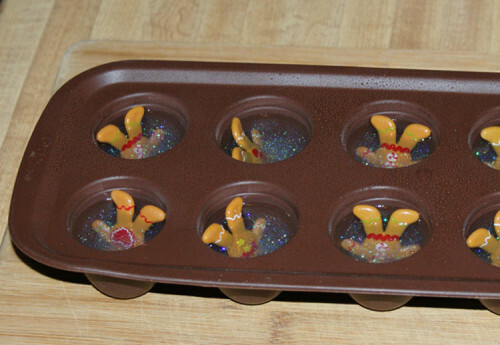 Now place one gingerbread man into each of the mold cavities and slowly pour the melted soap base into each cavity. Leave room around the lip of the mold so there is room to add the “snow” and snow globe base. Once you have filled each cavity equally with soap, spritz the top of the soaps with alcohol and allow to set up. (This base will set up fairly quickly if not overheated. Just don’t put it in the freezer or it will cloud your clear soap base.) Set the remaining soap base aside for use later. 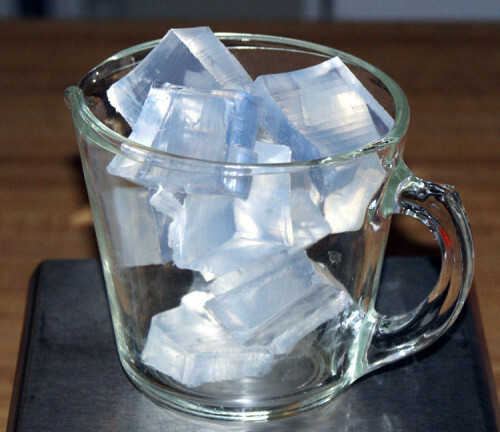 Once your soap has solidified, weigh out and melt the white melt & pour soap base in a second measuring cup. Spritz the tops of the solidified soap again with alcohol then slowly pour the white soap evenly in each cavity. Spritz with alcohol and allow to set up. Once the new layer of soap has solidified, re-melt the clear soap with fragrance and glitter. Next, Stir in just enough red pigment to created a deep red color. Spritz the molded soaps with alcohol, then slowly pour the red soap – what will be the snow globe “base” – into each cavity until filled. Spritz again with alcohol and allow to solidify. Once the snow globe soaps have completely set up, remove them from the mold cavities and wrap tightly with professional plastic food wrap film . This will keep them from sweating. Then label and add any other additional packaging as desired and they are ready to gift! 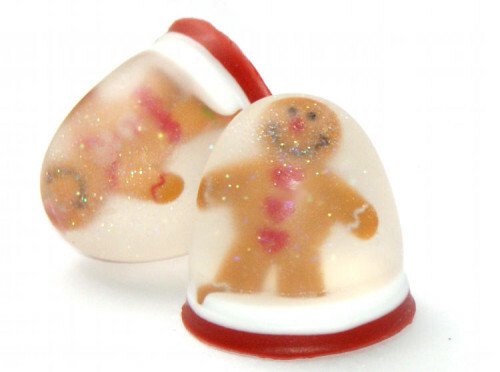 These snow globe soaps make great homemade stocking stuffers. Or gift them in a box of other fantastic treats for the holidays! For more fantastic homemade soap projects and recipes, be sure to follow my DIY Bath and Body Board on Pinterest. You can also follow my DIY Stocking Stuffer Sized Christmas Gifts Board and Unique DIY Christmas Gift Ideas Board for more DIY holiday gift ideas! Don’t want to miss a post? Follow Soap Deli News via Blog Lovin’ or sign up for my newsletter. I haven’t made soap in a while and I want to get back into it. JUst love love love this idea! i cant wait to try it out! That is so cute! Ive never made soap before and to say that I made it would feel really good. Thanks for the site, I want to order lots of stuff so I can get started! I’ve been eyeing this kit on WSP website….my grandkids would love these. I would like to win this for my niece because she collects snow globes. I would love to win this to do with my nephew when it’s a snowy day and we are stuck inside. I love Christmas crafts! They are so fun! The kit looks amazing! Thank you for sharing this with us. I just started making soap, and It’s so much fun! I would love to give this kit a try and use these guys as little stocking stuffers and gifts for friends. So love these snow globe soaps! I have many nieces and nephews and these would be so cute to give to them. Thanks for a great giveaway! This is such a cute kit — I’d love to make these with my children to give as holiday gifts. OMG this is SO cute. Thanks for the divine tutorial. I would love to make these for my nephew and grandbabies, they are just tooo cute! such a nice gift idea!! 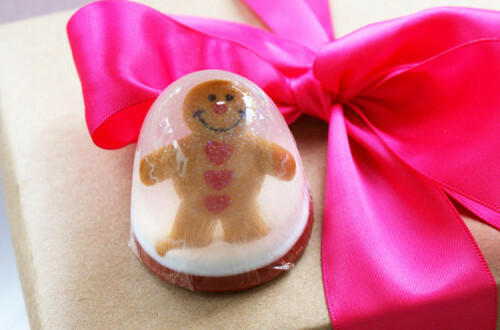 Love these gingerbread soaps! They would be so cute as party favors for my cookie exchange party!! Great Blog! So beautifully designed, such lovely writing! I want to win this for me and my girls to do together. I would love to win! My kids would really enjoy making it. Thanks for the chance!